PETA has just released a 15-month undercover investigation—spanning five states—into some of the largest pigeon-racing operations in the U.S. PETA documented massive casualties of birds during races and training, discovered rampant deliberate killing of the birds and abusive training and racing methods, and exposed a multimillion-dollar illegal gambling industry. 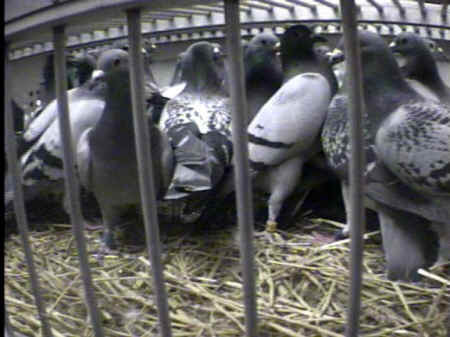 We need you to urge the Arizona attorney general to investigate these cruel and unlawful pigeon races now! I was shocked to learn that there is extensive felony gambling, racketeering, and tax evasion in pigeon racing. In races throughout the country, participants wager hundreds of thousands of dollars in betting pools and other gambling schemes. An estimated $15 million is at stake annually on the pigeon races, with some races bringing in more than a quarter of a million dollars in wagers. During the process, the intelligent, gentle, and loyal pigeons--who are regarded as nothing more than objects on which to wager--die or are violently killed by the thousands. In any given pigeon race, hundreds or even thousands of birds are torn from their mates and hatchlings, packed tightly into crates, loaded onto trucks, and driven as many as 600 miles away to see if they're able to return home faster than the others. As the birds are raised in captivity, they cannot fend for or even feed themselves away from home. Often 60 percent--and up to 95 percent--of the birds die in a given race from severe weather, predators, exhaustion, hunters, electrical wires, or starvation. Birds who survive the ordeal but aren't making their owners money and aren't valuable for breeding are typically killed by suffocation, drowning, neck-breaking, or decapitation. Please investigate and prosecute these unlawful enterprises immediately for brazenly violating federal gambling laws. Let them know that future violations will not be tolerated. Pigeons packed for an Oklahoma City, Oklahoma, race. A glimpse inside the transport truck before the release for a major Bronx, New York, race. Pigeons are released for a Bronx, New York, race. Wagers are displayed before a Bronx, New York, race. 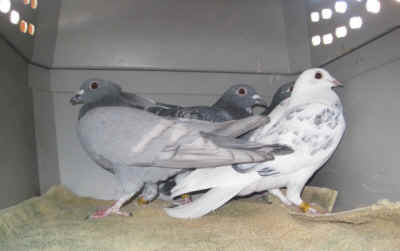 Pigeons rescued from culling (killing) arrive at a sanctuary.